Any television crime procedural worth its salt has a few common, yet genre-defining elements. The obsessive, can’t-sleep-until-the-crime-is-solved boss? Check. The attractive lab assistant who the costuming team puts in glasses to make her look more professional? Of course. And don’t forget the almighty pun used in the cold open. My personal favorite among these narrative devices, though, is a classic I refer to as the Evidence-Gathering-and-Testing Montage. Readers know exactly which portion of the show I’m talking about. Roughly half-way through an episode, viewers are treated to dark, ominous tones and close-up camera work featuring a lone lab worker meticulously toying with eye droppers, microscopes, and any other manner of scientific doodads in an effort to truly blow the case wide open. It’s a portion of the show that is always oh-so-important, but I can’t ever help but think that a real lab might not look so dour. Sporting a flat top, small bead, and large diameter like its big brother, the Truth, Dynamic Discs’ Evidence is the brand’s newest midrange. Originally debuted this summer at Trilogy Challenge events, the Evidence is now in full production in Lucid plastic, DD’s grippy, translucent premium blend. Billed as “slightly understable,” Dynamic Discs slapped flight numbers of Speed 5/Glide 5/Turn -1/Fade 0 on the Evidence, slotting it as a complementary piece to the Truth and Verdict in terms of feel and flight. The Evidence (white) fits nicely into the Dynamic Discs midrange family alongside the Verdict (orange) and Truth (blue). From a tactile perspective, DD hit it out of the park as a disc that feels similar to the Truth. Holding the two discs in hand, one immediately notices the shallow profile and flatness on both discs, with the main difference being the larger bead on the Truth. For players who appreciate molds that can feel familiar while covering difference lines, the Evidence fits the bill. As for a complementary flight to the Truth and Verdict, it also fits nicely into the mix, but that “slightly” qualifier in front of understable is, indeed, necessary. Out of the box and on a flat throw, the Evidence is difficult for this noodle arm to coax into that -1 Turn/0 Fade flight. Displaying a surprising amount of stability in the high speed portion of the flight, the Evidence held a nice long, straight flight before managing a slight fade. If I were in charge of the numbers, I’d be more inclined to flip them to 0 Turn/1 Fade. This isn’t a huge quibble, but rather information that can be useful for consumers expecting a flippy disc out of the gates. Flippy is not where this disc shines. Where it does shine, though, is in taking the angle of release and holding it for the majority of the flight. For an understable midrange, the Evidence displays a surprising amount of versatility and line-shaping ability. It’ll hold a long, gliding hyzer off the tee or on an upshot, and is capable of easy nose-up stall shots on the approach, as well. Even on the most gentle of hyzer releases – ones where most understable mids would easily flip up and begin to turn – the Evidence will hold the line unless the disc is given full power. Anhyzers are the Evidence’s bread and butter, though, which makes sense given its understable profile. Just the smallest pinch of anny and the Evidence will lock into a smooth turn before fading back for the last bit of its flight, making for beautiful S-shaped lines. It has become my go-to shot on Hole 16 at Kit Carson Park, where I’ll give the Evidence a high anhyzer ride over some orange trees, where it then settles in pin high or – due to the speed it shares with the Truth and Verdict – past the pin. I’ll take a 275-foot anhyzer off the tee with a midrange any day, please and thank you. 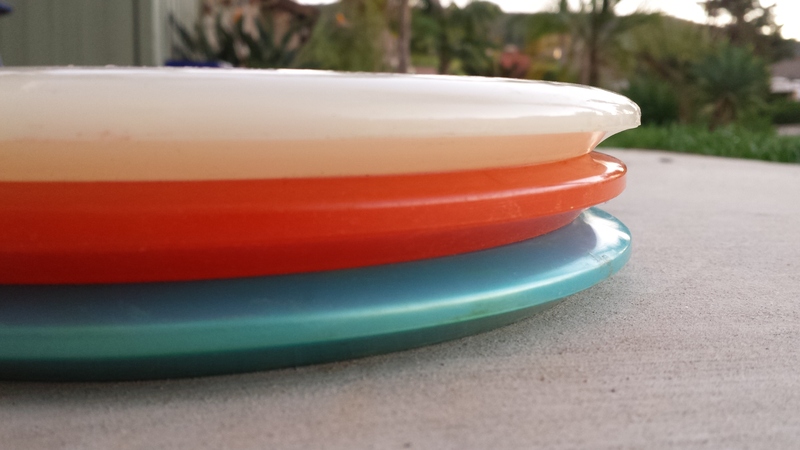 This disc’s versatility is truly evident, though, when I aim for the birdie trifecta I mentioned earlier in this post. Holes 7 through 9 at Kit Carson are all reachable off the tee with a midrange, but the lines required for each have subtle nuances that can make it easy to justify using different molds for each shot. 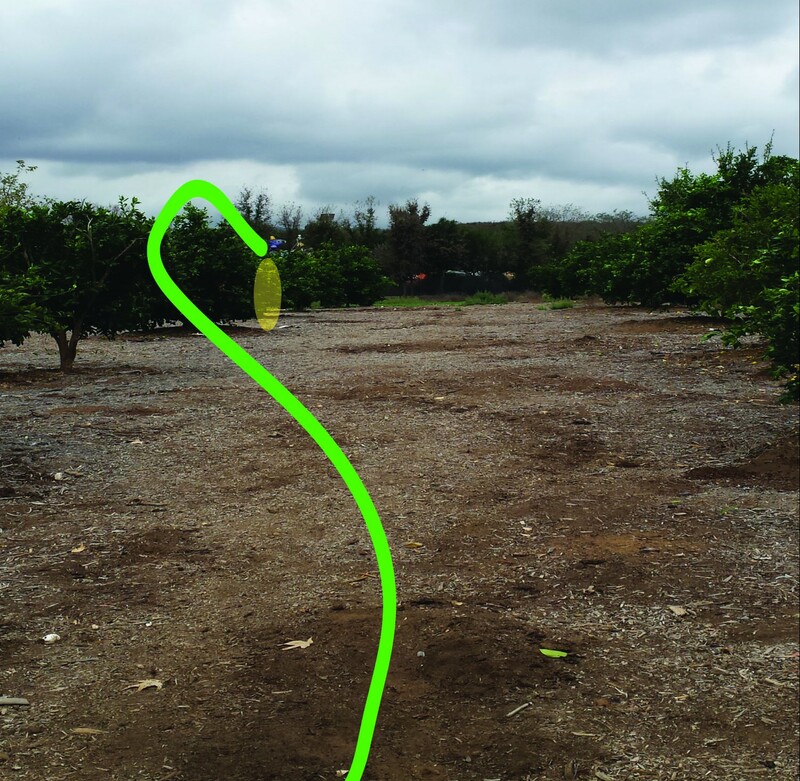 Since the open line down the gap doesn’t play well for a left-handed backhand thrower, I’ll toss the Evidence on a high anhyzer over the orange trees on Hole 16 at Kit Carson Park. But where’s the fun in that? I like the minimal approach, and the Evidence can handle them all. On Hole 7, I can go with the flat release and see that straight-to-small fade flight, but the low canopy requires that I really power the Evidence up to make sure all of its glide kicks in. If I’m having a poor driving day, the Evidence isn’t going to make it to the pin, but when I am driving well, it’s an easy park job. Hole 8 calls for the long hyzer line, and before DD sent me this 178-gram Evidence to review I was actually using a 170-gram Fuzion Truth here. The Evidence handles the shot in a similar fashion to this lighter Truth, but has the added benefit of fading slightly later, putting me in a landing zone that avoids a tree that is positioned just short of the basket. Hole 9 is a wide open look now that a dead tree was removed, but for a left-handed player like myself there is danger at the end of the flight: Any fade whatsoever, and you up in a creek. Using the Evidence here, then, I employ a heavy anhyzer so that the disc will, if thrown well, end up with that zero fade number that Dynamic advertises. Here is my one caveat for the Evidence, though, and it comes back to three little words you just read: if thrown well. The Evidence is incredibly rewarding to throw when you execute the release angle properly and get it up to speed, but it requires a decent amount of oomph to get these lines to hold. For example, there have been a few times where I have not thrown the Evidence with enough power, and it has faded out and ended up in the Hole 9 creek. In other instances, such as standstills with poor footing, I have found the Evidence to finish a bit more overstable than I would like it to. Since DD sent me an Evidence on the heavier end of the spectrum, though, I tracked down a lighter one – 173 grams – to see if there would be any difference in flight. While I found a bit more high speed turn and a touch more glide, I was still getting some fade on the back end. I think going even lower – to that 170-gram sweetspot I prefer with the Fuzion Truth, perhaps – would be perfect, but I haven’t found an Evidence that light yet. As a result, I’d put a noodle arm advisory on the Evidence that it is “power understable.” That is, you’ll need the speed to see the correct flight. If you don’t have it, you’ll need to look for something outside of the Dynamic Discs lineup – or beat the Evidence up for a bit – in the meantime. Don’t get me wrong: The Trilogy Challenge Evidence was a nice flyer, exhibiting similar tendencies as this Lucid release. The difference, though, is in how the discs feel. My TC Evidence had a noticeably higher shoulder and a little bit of dome to it, which made it feel a little more clunky in the hand. The dome provided it with a bit more glide, but I much prefer the sleek speed of the Lucid, as it just feels like a weapon that is ready to be unleashed. Even with the power required, the Evidence is sticking around in my bag for the foreseeable future. It gives me the chance to make my own luck by controlling its release angles, and the length it provides off the tee is invaluable for a player with less distance. Much like those crime dramas, it simply takes a little work to crack the case. That just makes the reward even sweeter. 3) LIKE and COMMENT on the pinned post for this review at the Noodle Arm Disc Golf page. For your comment, tell me your favorite crime show on TV, past or present. No crime show, no shot at winning. The contest will run until Thursday, November 26 at 9 p.m. PDT, when a random winner will be chosen. Thanks to Dynamic Discs for providing the plastic! Great review! I have a white 178 Evidence that looks like a different stamped clone of that one and I’ve made the same observations. Definitely a mid that likes to be thrown without being powered down. Forgot my favorite crime show: Psych. (Formerly Rockford Files).